Adding the KNORR Aromat to the chicken before cooking will add flavour and crisp up the skin like crackling. Clean and trim the chicken breasts and season with the KNORR Aromat and 1/2 the oil. Pan fry the chicken breast in a large preheated fry pan until golden brown on both sides and the skin side becomes crispy. Place in a preheated oven (180 degree Celsius) until cooked through, remove and allow to rest for 5 minutes. Note - When cooking meat in a frying pan, oil the meat not the pan. This will prevent splashing of hot oil and assists in preventing the meat from sticking to the hot pan. Peel and dice the pumpkin, drizzle over the remaining oil and roast in the oven with the chicken breast until golden brown and tender. Preheat a pot and place in the green peppercorns and cream, slightly reduce and add the warm water, whisk in the KNORR Demi Glace Sauce Mix and continue to stir until boiling, reduce heat and simmer for a further 5 minutes. 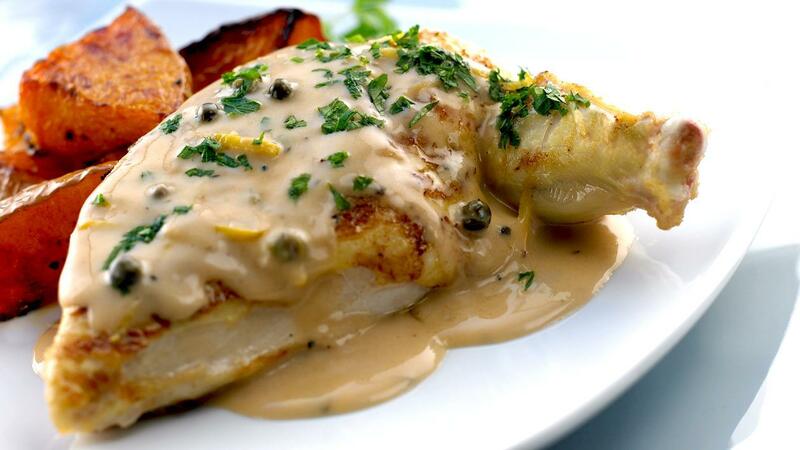 Serve the pan seared chicken breast with the roasted pumpkin and pour over the green peppercorn sauce.